Bulova 1960 Flight Nurse "B"
Here I present a family heirloom that has been in my family since new. It is cased in 10KT RGP with stainless back marked M1. It has a silver dial with gilt numerals and hands. This watch also has the red second hand. The movement is a Swiss made 6CFC with 17 jewels, also dated M1. It also has the original expansion bracelet; the design matches the case lugs. There are no other items, such as a display case or paperwork. The pricelist for 1961 shows that there is either an 'A' or 'B' variant, but the ads do not specify which is yellow or white. Stunning pictures. Sure looks like the Flight Nurse to me. ...even w/ original bracelet!! I see in the 1954 November price list, we have American Nurse and Air Nurse....and as noted, Flight Nurse came along a little later. 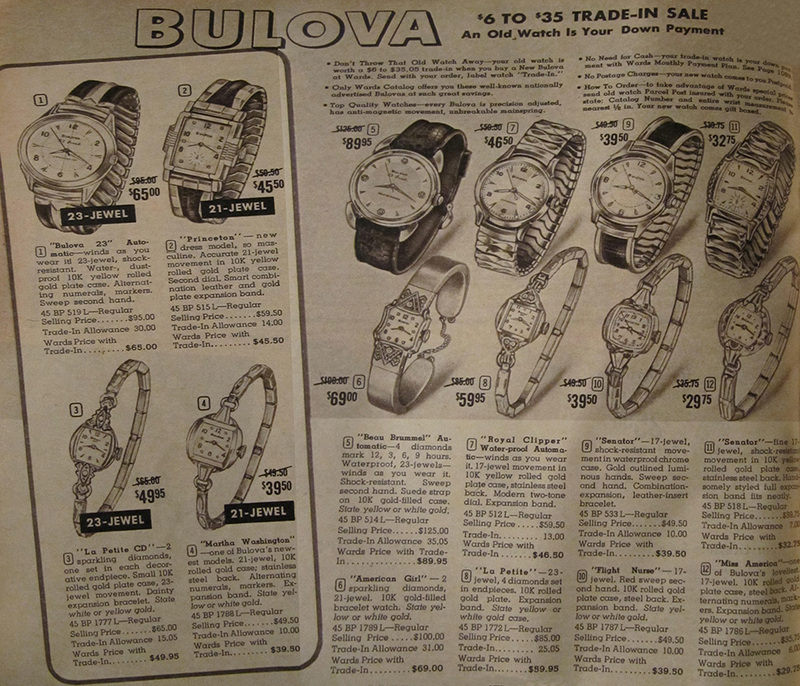 At the very first few pages of the price lists Ken used, there is a section which indicated new watches (by men and women). This preceeds the entire price list. This earlier new watches section often gives the gold color of variants, and sometimes dial color. Below is a snippet from this part of the Fall 1961 price list giving gold color by variant for both listed Flight Nurse watches. Ken I say you have a "Flight Nurse" variant "B" (the W or Y in second column corrisponds to gold color. There is no "key" to state this fact, but it's been demonstrated true in countless other watches for which we have ads listing variants and showing gold color). Thank you for pointing that out; I missed that NEW section completely. I'd say we could add the 'B' variant. I thinjk you'v e nailed it. WELL DONE. I agree with this ID. Good use of the price lists, excellent pics, very nice subject watch. All round perfect thread. Flight Nurse "B". Flight Nurse B, and what a beautiful example! Agreeing with all - Flight Nurse B she is. This watch is in perfect condition, I want to hear more about the family history. Not much history to provide unfortunately; it was my mother's watch and is now in the care of my sister. I don't think my mother had ambitions of being a nurse, but was a flight attendant for a short time back in the 60s. I was recently given the watch to clean and polish and have serviced. It had been in disrepair for quite some time. Hopefully now it will be used and enjoyed on occasion. Still a wonderful story Ken, and a precious memento, I'm sure. Hard to believe it's the same watch. Excellent work!